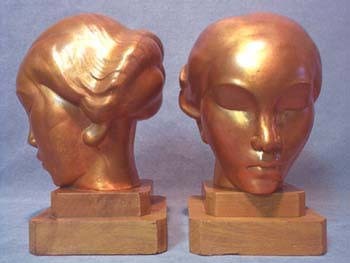 These fabulous bookends are unmarked, and closely resemblance Frankart's classic female bust. Beautifully finished with copper wash and mounted atop 4-5/8" square wooden pedestals, their total heights are 8-1/2". Each bookend features a demure young woman, eyes downcast, and sporting a soft coiffure. Both lovely ladies and their bases show some aging, but these pieces are in exceptionally good condition, and will add great character to any library.